The 2015 Summer Intensive Institute is nearly upon us. The Institute will start on Monday, June 22 on the Columbia College campus, and will run through Saturday, June 27. Along with a variety of STEM content and activity sessions, participants will also have a two day field experience at several locations within the Delta region. Along with the content, we have built in ample time for networking with colleagues, team building, reflection, and development of the participants' STEM-integrated units. We will all gather at Calaveras Big Trees to share our Unit Development Teams’ progress. Each team will be highlighting their unit, big ideas, and essential questions that have been developed up to that point. Following presentations we’ll be taking the end of Year One assessment which will also serve as the initial assessment for Year Two (in other words, no more tests for six months!). After the test is completed, you’re welcome to join in on a hike around the North Grove (easy 1.7 mile loop), and perhaps even the South Grove (moderately difficult 3.5 to 5 mile loop) if you’re up for it. TOPS Partners, Lead Teachers, and prospective Partners and teachers are invited to attend this one day workshop hosted at the InnovationLab in Sonora. Partners and Lead Teachers will share their experiences, and classroom activities will be demonstrated. Year Two’s Intensive Institute will begin on Monday the 22nd of June and will conclude in the early afternoon on Saturday the 27th. Besides the sessions and activities planned for the college, we’ll be taking a two day field trip to the Delta region. Lodging in Sonora will be provided for Amador and Calaveras residents. Continental breakfast and lunch will be provided by the Culinary Arts program while at Columbia College. Lodging (two nights), meals, and transportation will be provided while on the field trip. STEM Resources - Math, Science, and Beyond kits available for checkout at the TCSOS. Splish! Splash! - Water has properties which allow it to interact with gases, solids and other liquids. Crawlers, Hoppers, and Fliers - Living things have observable structures that help organisms live and interact with their environment. Huff n Puff - The earth is surrounded by a blanket of air that moves, contains moisture, and can be warmed or cooled. Drops, Bubbles, and Balance - Matter has different properties, comes in different states, and can change states. Nitty, Gritty, Dirt and Fossils - The earth is very old and constantly changing. Power Connection - Magnetism and electricity have basic properties which allow them to interact with each other. Build and Balance - The supporting power of a structure is dependent upon the design of the frame and materials used. Let the Force Be With You - Machines are devices for increasing, decreasing, or changing the directions of forces. Come Fly With Me - If the forces acting on an object do not cancel out, they cause a change in the motion of the object. More than Magic - Reactions and interactions indicate properties of matter. The Kings Canyon Science Demo Center has been tasked with producing a newsletter on the various CaMSP grants throughout the state, and STEM-TRACKS was highlighted in the current issue. Use the link below to read the newsletter. Participants have been tackling the challenge of a multi-component math webinar. The grade-specific webinars were designed by Aimee Campiotti and Karen Sells to enhance understanding in California State Common Core Math standards by providing hands-on lesson activities and worksheets, and providing feedback for evaluation. As a tie-in with the Hour of Code that many of our participants completed with their students, TCSOS staff took about two dozen high school students and their teachers to the co.lab facility in San Francisco to allow the students to experience the work environment, try out some of the apps and products being developed there, and provide feedback to the developers. co.lab is an incubator for innovative educational software startups that provide office space, mentoring, and funding for a four month term. During that time the companies can focus on developing and delivering their products to market. 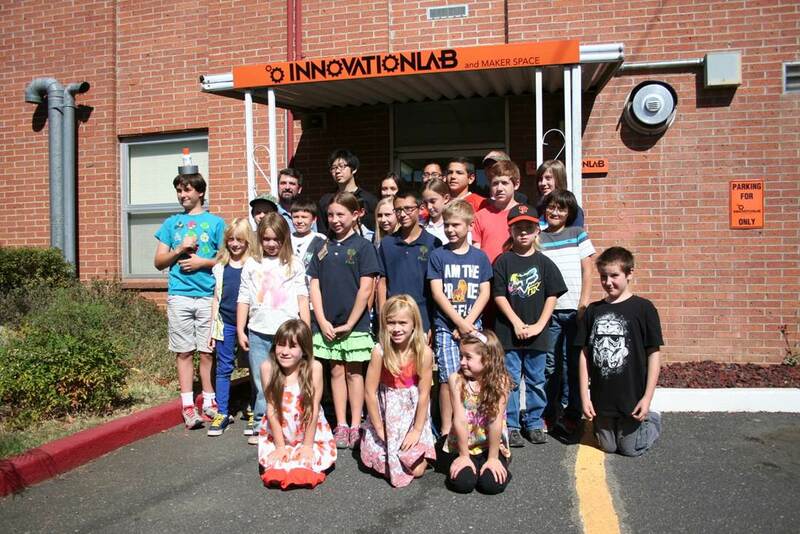 Our students worked with MindBlown Labs, Piper, and CodeMonkey products. For information on co.lab and their product partners, check out their link below. The Teaching Opportunities for Partners in STEM (TOPS) program is active in Tuolumne County but is looking to expand into Calaveras and Amador counties. We need your help in identifying motivated and talented scientists and engineers that want to bring their expertise to the classroom. Use the TOPS link above to find out more about the program! The Tuolumne County Superintendent of Schools Office, in conjunction with the InnovationLab, hosted the First Annual Tuolumne County Global Cardboard Challenge. Over 400 elementary school students participated by creating various projects using cardboard and other recycled or recyclable items. Projects ranged from cardboard play castles to robot suits to functional games like skeeball and air hockey to works of art and musical instruments that really worked! Teachers and Columbia College student volunteers selected the most innovative projects to showcase on October 11 at the InnovationLab in Sonora. Three high school teams were presented with an engineering challenge that had to be completed within one hour using only cardboard and masking tape in the construction. Their challenge was to build a dining room style chair that met certain dimension requirements and that could support 150 pounds for at least 30 seconds. The winning team from Summerville High's Connections Academy not only completed the challenge, but exceeded the strength requirement. Their chair held 200 pounds with only minimal deformation, and finally collapsed after an additional 50 pounds were added. The Summer Intensive Institute was hosted by Columbia College from June 23 through June 28, 2014. A total of 57 teachers from Tuolumne, Calaveras, and Amador counties completed the intensive training. During the week participants attended grade-specific training sessions in California Common Core State Standards in Mathematics, Google Apps, and Next Generation Science Standards. Science activities included performing Project WET's "Is There Water on Zork?" lab, learning how to use a compass, inclinometer, and sling psychrometer, and how to measure their pace and calculate the height of a tree. A two-day field experience included a tour of the Rim Fire area with stops at one of the containment lines constructed during the fire and at an active salvage logging operation within the heart of the fire zone. The participants spent the night on Sonora Pass, half at the Kennedy Meadows Resort and half at Columbia College's High Sierra Institute at Baker Station. On the second day stops were made at the Columns of the Giants geologic site and Pinecrest Lake. At both locations additional data were collected and presentations were made that described their evaluations of the ecology of each of the stops made during the two days.